Winslow Homer is considered the most important American painter of the second half of the 19th century. Principally known for his depictions of stormy seas, Homer was one of the first artists to focus on the theme of bathers on the beach, which had recently been made fashionable by Eugène Boudin in Paris in the mid-1860s. A self-taught painter, Homer was receptive to the new European trends in art. While there is no evidence that he met the future Impressionists during his trip to Paris in 1867, the paintings that he produced in the late 1860s reveal similar artistic concerns. 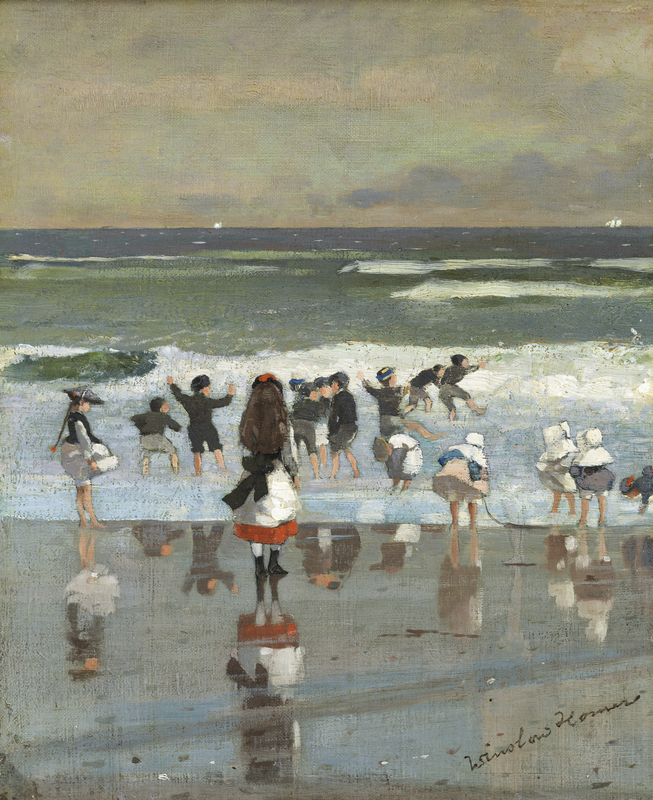 Among Homer’s works, Beach Scene comes closest to Impressionism, both for its lively handling and its luminosity. In order to paint it, Homer located his canvas parallel to the shoreline but a few feet back from it, resulting in a composition structured through three broad, horizontal bands of almost identical size. The scene is almost devoid of incidental detail and the perspective seems flattened. Perhaps the most striking element is the emphasis on the reflections of the children on the wet sand, the liveliness of which contrasts with the real figures. At the 1869 winter exhibition of the National Academy of Design in New York, Winslow Homer exhibited what one critic called "a Watering-place deformity" entitled Low Tide. "Conspicuous in the foreground are several pairs of boots painted to life, " the critic of the New York Tribune wrote. "The owners, not so much taller than the boots, are dabbling in the water a few rods off, apparently. There is no sense of distance to justify the smallness of the figures or the unwaterishness of the waves. Nothing but an evident honesty of intention-a purpose to paint just what the eye saw, neither more nor less-saves the painting from being slightly ridiculous." "We would pass this by without a word of comment were it not evidently a picture which by its size and show of color challenges criticism, even as the impress of an unclean hand upon a newly painted wall does, " wrote a sharply critical reviewer in the New York Mail. "How an artist of acknowledged worth in a certain field of art could permit this horror to leave his studio is simply incomprehensible to us." He then went on to describe it: "Here we have three grand horizontal layers of color-like rock strata. The upper is of brownish gray and dirty white with a suggestion of vermillion now and then-like the marble of Brachificari. This is the sky. The next lower level is of dark greenish blue, like some coal layers we have seen. On this there are dashes of flake white here and there which remind us the story of how the artist succeeded in getting the foam on the mouth of a mad dog he was painting-by throwing his dirty sponge in indignation at the canvas. This second layer is the sea. The third is a belt of brown of May shades, and this is the beach; and to do it justice it looks like a beach, but it is the only division of the picture which taken apart has any evidence of design in it. The rest suggests unhappy accident on canvas only. On the wet sand, and on the dry sand, and further out towards those mysterious white places, are children bathing or about to bathe [...] But among these figures is one to whose presence we object. It is of a young lady, with her back towards us and her hair in charming negligé, who stands close to where the water is supposed to be coming in and looks on. We don't object to her presence because her back is toward us, but because of her height-she is seven feet tall. Now, we don't believe that any young lady of her age of that height was down there [...] On the strand are children's boots and things, and these and the strata make up a picture which covers some twelve square feet of canvas at the least." No painting by Homer of this size or description now exists. But there are at least two remnants of it. One of them is the Thyssen-Bornemisza Beach Scene. It corresponds exactly to the critic's description of "children bathing or about to bathe" and the disproportionately tall young girl with her back to the viewer, "her hair in charming negligé." And, as the surviving head and shoulders of a bending child at the lower-right edge indicates (she is seen complete, thought reversed in the centre of the wood-engraving, Low Tide), it seems quite clearly to have been cut from a larger canvas. One other part of Low Tide survives, On the Beach, in the Canajoharie Library and Art Gallery, New York. To it, the Thyssen-Bornemisza Beach Scene fits perfectly at the left. Allowing for cutting down at top, bottom, and sides, and allowing, too, for some approximation in the size the critic gave for the original Low Tide ("twelve square feet of canvas at the least"), joining the two together would produce a painting approaching a dimension of twelve feet square. On 6 August 1870, two companion engravings were published in the periodical Every Saturday. One, High Tide, was made with some slight changes after Eagle's Head, Manchester, Massachusetts, (New York, Metropolitan Museum of Art). The other Low Tide, containing as it does figure groups from both the Thyssen-Bornemisza and Canajoharie paintings, as well as "children's boots and things, " was apparently made after the dismembered Low Tide. The first owner of Eagle's Head, William F. Milton, after acquiring it "promptly" after Homer exhibited it in 1870, wanted to acquire its "companion picture, " Low Tide, as well. But when he "went to Homer's studio a year of two later to buy Low Tide, he was told that the picture had been painted out and the canvas used over again for some new subject." It does not matter that the painting was not painted out-though parts of it were, such as a figure at the right of the Thyssen-Bornemisza picture whose legs remain reflected in the wet sand, and in the Canajoharie painting a figure group in front of the breaking wave at the right of which a reflection also remains-but, as Homer seems to have been unwilling to admit to Mr. Milton, cut up [fig. 1]; what does matter is that a few years after it was painted, or maybe sooner, it no longer existed in its original form. Homer's overall conception of the painting, and its shape, is preserved only in an oil sketch, The Beach, Late Afternoon, datable to 1869. Why Homer cut up the painting is not known. One reason for his doing so, however, may have been that it was not only criticised severely as "ludicrous" and "deformity, " but that he took literally the observation of the critic who, though he did not like Low Tide as a whole, said it was redeemed somewhat ("it would not be the work of Homer if it had not a lurking charm somewhere") by parts that are "charmingly-posed little pictures in themselves." Low Tide is one of several works-one other painting and two other wood-engravings (besides Low Tide)-that Homer made of the fashionable "watering place" at Long Branch, New Jersey, in the late 1860s. Homer, like artists elsewhere in the 19th century, such as William Powell Frith in England, for instance, or Eugène Boudin in France, perceived the beach scene to be a particularly modern subject, and one, moreover, than lent itself especially well to the description and analysis of the nature-its composition of classes, characters, and costumes-of modern life.